I had the opportunity yesterday evening of attending a concert by the Royal Oman Symphony Orchestra (ROSO) playing in its home city of Muscat. Founded in 1985 and offering its first public concert two years later, ROSO is very much a personal project of the long-ruling Sultan Qaboos bin Said (b. 1940, r. 1970-). As a flattering newspaper profile explains, "ROSO emerged as a novel and a poetic idea; an idea born in the heart and soul of a benevolent leader. The idea was nourished by passion, love, and understanding of culture as a tool towards cultural diplomacy, understanding, diplomacy." Under the direct supervision of His Majesty, young talented musicians from both sexes were selected in 1985 based on basic musical skills of melody, tempo, and rhythm. Under the umbrella of the Royal Guard, they were subjected to intensive studies in music both in Oman and abroad. As anticipation grew, the arrival of instruments was a cause for celebration. ... At [a] young age, Omani musicians were subjected to intensive training within the boundaries of the palace. It was not unlikely for the young musicians to attend rehearsals only to see His Majesty himself waiting outside the classrooms, anxious to hear and encourage the first note. Qaboos insisted that the musicians all be Omani nationals, restricting foreigners to teaching, soloist, and conducting roles. Sometimes he took up the baton and himself conducted the orchestra. The Mar. 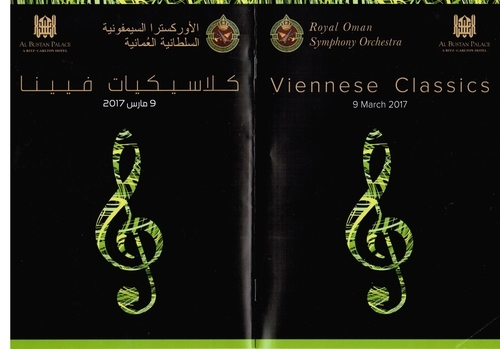 9, 2017, program of the Royal Oman Symphony Orchestra. The concert I attended was titled "Viennese Classics" and featured two parts of Mozart's Idomeneo, Beethoven's violin romance #2, and Haydn symphony #101, conducted by Justin Bischoff. I recorded the Beethoven segment. The concert took place in a European-style classical music concert hall, the Oman Auditorium. The audience filled about half the auditorium and was about 90 percent Western, with the rest Omani with a sprinkling of South Asians. Tickets nominally cost US$25 but many were given away. In the orchestra pit, the men wore elegant white-tie tuxedoes; the women wore red hijabs over green dresses, except for the female violin soloist, who wore white on white. 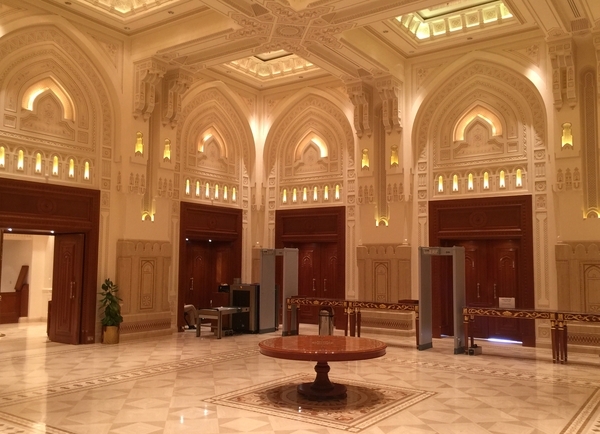 (1) ROSO is part of a larger Western classical music project in Oman sponsored by the sultan; of particular note is the 1,100-seat Italianate Royal Opera House Muscat, a purpose-built structure that opened in 2011. (2) In keeping with my thesis that "you need Beethoven to modernize," I understand the sultan's eagerness to bring Western classical music to Oman as a sign that he understands a profound truth: modernization requires Westernization. (3) This understanding was more common in the heyday of Western confidence. The Khedive Ismail of Egypt built an opera house and commissioned Verdi to write Aïda on the occasion of the opening of the Suez Canal in 1869. A leading pasha built the Süreyya Operası in Istanbul in 1927 (although it only staged its first opera in 2007). (4) That said, Western classical music, and opera especially, still enjoys surprising prestige. The shah opened an opera house in Tehran in 1967. The Mubarak regime encouraged a gala production of Aïda in Luxor in 1987 and a replacement for the khedive's burnt-down opera house opened in Cairo a year later. The Dar al-Assad for Culture and Arts serves as the opera house in Damascus since 2004. Turkey's President Erdoğan plans to tear down an ugly 1960s opera house and replace it with the largest opera house in Europe. These instances suggest that some rulers, even Islamist ones, understand the connection of Westernization to modernization. (5) Let us hope the trend continues, with symphony orchestras and opera houses appearing in such cities as Benghazi, Sanaa, and Kabul. Mar. 19, 2019 update: In a variant on the above, I attended this evening a concert performance of Mozart's Le Nozze di Figaro in the Mozart Hall of the Konzerthaus in Vienna. 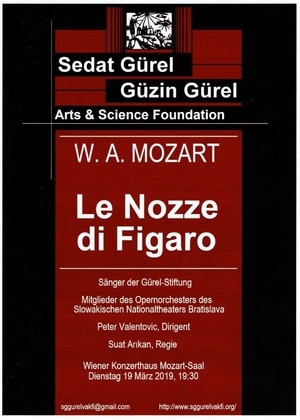 "Le Nozze di Figaro" played in the Mozart-Saal of the Konzerthaus in Vienna on Mar. 19, 2019. Nothing surprising about that, you say, as the opera had its debut a few blocks away in 1786 at the Burgtheater. But the surprise comes from the singers (but not the conductor or musicians) all being Turks and the event sponsored by a Turkish foundation, the Gürel Güzin. 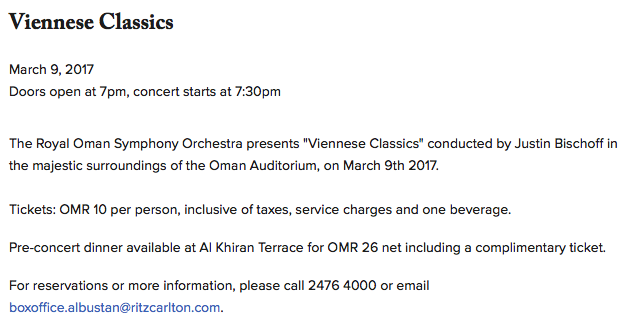 So, not only is Western classical music being cultivated in the Middle East but emissaries from the Middle East and bringing it right back to its birthplace. I like that.